Two lines are perpendicular if they intersect each other to form two 90° angles. A line bisects a line segment if it divides the line segment into two equal lengths. The length of each of the new line segments is said to be "equidistant". A perpendicular bisector is a line that intersects a line segment to form two 90° angles and divides this line segment into two equal lengths. Two or more lines that meet at a point are called intersecting lines. 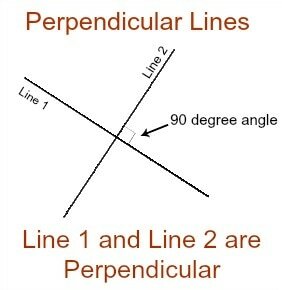 Two lines that intersect and form right angles are called perpendicular lines. The symbol ⊥ is used to denote perpendicular lines. A transversal is two parallel lines intersected by a third line at an angle. 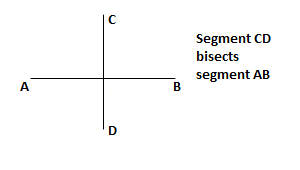 The third line is referred to as the transversal line. When this line happens, several angles are created. You can use these angles to find the measurements of other angles. 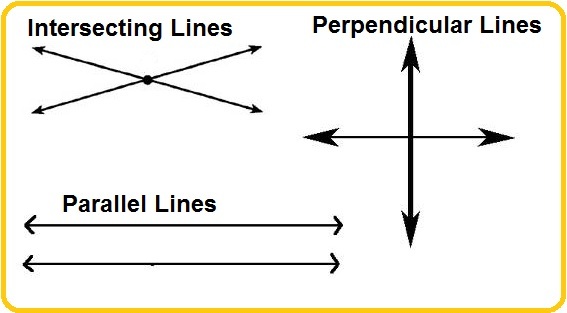 When lines intersect, there are several types of angles that are formed. Becoming familiar with these angles will greatly help your understanding of geometry. Firstly, some terms that will benefit your learning. Adjacent Angles - Two angles are Adjacent when they have a common side and a common vertex (corner point) and don't overlap. In the diagram below (supplementary angles) angle 70 and angle 110 are adjacent to one another because they share a common side. Straight Angles - A straight angle forms a "straight line" and is equal to 180 degrees. 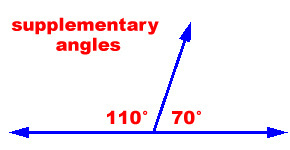 1) Supplementary Angles are pairs of angles that add up to 180 degrees. If you put two supplementary angle pieces together, you can draw a straight line across the top of the two angles. In essence, the two angles together make a half circle. Supplementary angles are not limited to adjacent lines as in the diagram to the right. They can be any two angles whose sum is equal to 180 degrees. 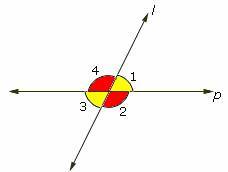 2) Opposite Angles are angles directly opposite to each other when two lines intersect in a plane. They are congruent which means that their angle measurement is equal. ​In the diagram to the right, angle 1 is opposite to angle 3 and angle 2 is opposite to angle 4. When two parallel lines are given (see figure to the right), there are two ​ main areas: the interior and the exterior. When two parallel lines are cut by a third line, the third line is called the transversal. In the example to the right, eight angles are formed when parallel lines m and n are cut by a transversal line, t. There are 4 angles on the exterior of the figure (angles 1,2,7,8) and 4 angles on the interior of the figure (3,4,5,6). ​1) Alternate interior angles (see left) are two angles in the interior of the parallel lines, and on opposite (alternate) sides of the transversal. Alternate angles are non-adjacent and congruent. ​Alternate exterior angles (see right) are two angles in the exterior of the parallel lines, and on opposite (alternate) sides of the transversal. Alternate exterior angles are non-adjacent and congruent. ​2) Corresponding angles are two angles, one in the interior and one in the exterior, that are on the same side of the transversal. Corresponding angles are non-adjacent and congruent. 1) Equilateral Triangles have 3 equal side lengths and 3 equal angles (always 60°). See diagram to the right. 2) Isosceles Triangles have 2 equal side lengths and 2 equal angles. See diagram to the left. ​3) Scalene Triangles have no equal side lengths and no equal angles. A quadrilateral has 4 straight sides. In a square the angles are all 90 degrees (see diagram on the far right). The interior angles of a square add up to 360 degrees. However, if we tilt the edges slightly (see diagram to the immediate left) the sum of the angles is still 360 degrees. Therefore, we can conclude that the Interior Angles of a Quadrilateral always add up to 360°. What About Polygons with more than Four Sides? Therefore, we can conclude that the Interior Angles of a Pentagon add up to 540° (or 180° more than a quadrilateral).